Plaid Hat Games has announced Stuffed Fables at Gen Con 2017. 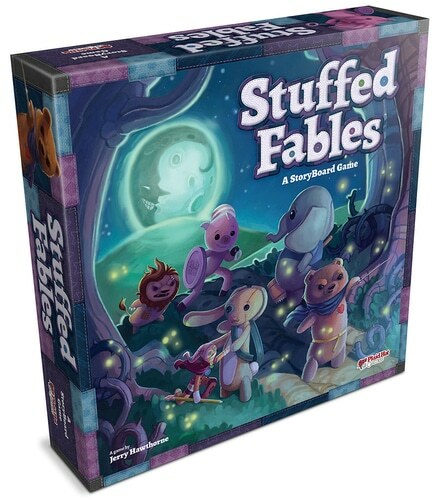 This is a unique adventure game where players control a group of loyal stuffed animals that battle to save the children they love, and are sworn to protect, from the forces of evil. This is the first game in Plaid Hat Games‘ StoryBoard Game series. These are games where both the action and the narrative are driven by a special game book that acts as a rules reference book, a game board, and a story reference all in one neat little package! Each of the game’s adventure scenarios takes place across a pair of pages in the book. The book is spiral bound and opens flat for each scenario to show off a map, or piece of art that is related to the story. Fables is an adorable game, there is no question about that. But, I think the most interesting part of this announcement is that it is the first in a new line of games from Plaid Hat Games. These Storyboard games provide a lot of opportunities for storytelling in their other franchises. Imagine, if you will, a Storyboard game set in the Mice and Mystics universe? That’s a great fit. Further, all they need to do to release expansions is release new books. This means cheaper production costs, faster releases, and fewer giant boxes on gamer’s shelves. Are you going to be picking this one up for your family? Let us know in the comments!